No Child Left Behind, which should rightly be named "No Child Left Un-indoctrinated," is nothing more than equalizing the playing field where all students become equal (communism), and is a program that shoots for the floor and not for the stars. 3) Common Core. Common Core is a "one-size-fits-all" federal redesign of the entire U.S. education system and is developed entirely by a select few individuals; this grand redesign is being aggressively marketed by federal bureaucrats, private trade associations, global corporations, state governors, billionaire philanthropists and politicians in all political parties. No parent, teacher or citizen approval. No public debate. No legislation was passed or new federal funding authorized. Without the slightest amount of valid academic research to validate this, Common Core claims to have "rigorous" and "internationally benchmarked" standards that will "enhance college and career readiness for America's children." "The Bible is not merely another book … it has and remains an incredibly dangerous book. … I am convinced that the battle for humankind's future must be waged and won in the public classroom by teachers who correctly perceive their role as the proselytizers of a new faith. … These teachers must embody the same dedication as the most rabid fundamentalist preachers, for they will be ministers of another sort, utilizing a classroom instead of a pulpit to convey humanist values in whatever subject they teach. … The classroom must and will become an arena of conflict between the old and the new – the rotting corpse of Christianity, together with all its adjacent evils and misery, and the new faith of humanism, resplendent in its promise of a world in which the never-realized Christian ideal of love thy neighbor will finally be achieved." 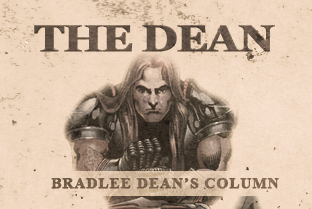 Listen to Bradlee Dean's radio broadcast, "The Sons of Liberty," here.